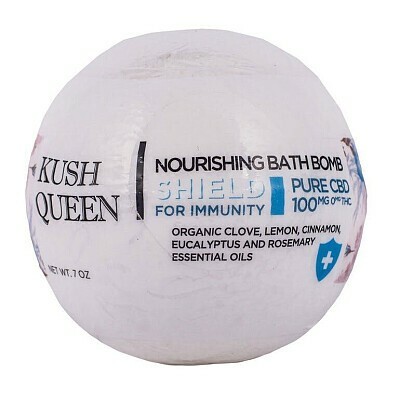 Our Shield for Immunity Bath Bomb is loaded with 100mg of pure CBD and created to provide a healthy boost to the immune system while offering a deeply soothing bath time experience. Inspired by the 15th Century legend of four thieves, we have hand blended a powerful and aromatic mixture of clove, rosemary, cinnamon and other natural botanicals believed to provide a shield of protection by supporting and strengthening the body and its immune system. All of our nourishing bath bombs are hand made with 100% Organic essential oil blends, lab tested C02 cannabis oil, and CBD isolate with no artificial dyes, or preservatives. We use high quality food coloring, so it will never stain your tub and is safe for absorption.